Many bears saved from captivity, hunting and trading have been transported to one of Vietnam’s largest bear sanctuaries, where they receive the best care from the wildlife well-being workers. Most rescued bears had already sustained injuries and had unpleasant experiences when they were first carried to Vietnam Bear Rescue Center in Vinh Phuc Province, which is Hanoi's neighbor. The sanctuary, founded in 2005 by wildlife charity Animals Asia, is now a cozy home to 178 bears that seem to have a happy life thanks to the care of 76 workers, mostly foreign veterinary professionals. “Here they can play with toys and one another quite happily,” said Phan Thi Thuy Trinh, one of the workers. Trinh added that the animals have a list of provided foods that vary seasonally. “They get gifts on major public holidays,” she said. Annemarie Weegenaar, who prefers to be called Anna, has spent nearly a decade helping rescued bears in Vietnam and now leads the bear care division at the center. She was visibly touched telling Tuoi Tre (Youth) newspaper the past plight of the bears before they were brought here. She said after many bears were rescued, they suffered distress and their health was so poor that they had to undergo surgery and special care to be able to recover from the shock. It was very difficult to approach the mammals when they were new at the sanctuary, as they were frightened by memories of maltreatment from humans for a long time, she said. What the bears experienced sometimes scared even the workers. A bear cub lost an eye and had one side of its body severely wounded after being hit by a hunter who had killed its mother in front of it. The animal is now still afraid of crowds of people although it has grown up, Anna said. At the time of their respective rescues, some bears were found to have lost their hearing and sense of smell, some sustained necrosis and some were unable to stand on their feeble legs. A bear was named Survivor after it was the only found alive at a bear farm in north-central Vietnam. The animals were not fed at the farm and Survivor was nothing but skin and bones when rescuers found it. Another bear, Vandrew, was found with one of its arms damaged, as the animal had bitten the limb out of intense thirst when it was caged. Vandrew was saved and taken to the center, but it can only move by jumping now as doctors failed to help him regain the use of the arm, according to Anna. The key element in the bear care is the workers’ love, she underlined. Bears at the center were given various names after people who granted sponsorship for the animals such as Olley, Rose, Dolley, Coco, Mausi, Mausi, Moggy, Bubu, Nelson and Easy. Anna said the workers have to memorize all the names, which are often the only way to draw the bears’ attention. 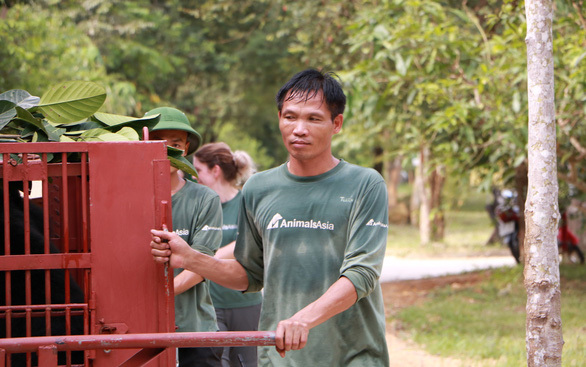 One of the workers who have formed a cooperation lasting 12 years – the longest time of all – with the sanctuary is Dao Chau Tuan, who goes by the nickname Tuan “gau," or Tuan the Bear. He gives care to the bears and sometimes lost slept over how to create toys suitable for their injuries. “When I come up with an idea, I immediately commit it to paper, fearing it might slip out of mind,” he said. He was one of the workers who held Christmas celebrations for the bears, which he said gave him great joy seeing the mammals running out of the cages to get colorful presents hanging on Christmas trees. The other day, Tuan was receiving medical treatment in a neighbor of Vinh Phuc when he suddenly left the hospital and ran back to the center to see the bears, he recalled, giving yet another example of his deep affection for the animals. He said the service for the bears has vastly transformed him from a person who has no interest in wildlife into someone working enthusiastically for them. “I rescued bears multiple occasions and realized how badly they had been treated. I started developing a love for them,” he said. “My character gradually changed. I've become more composed and kinder.